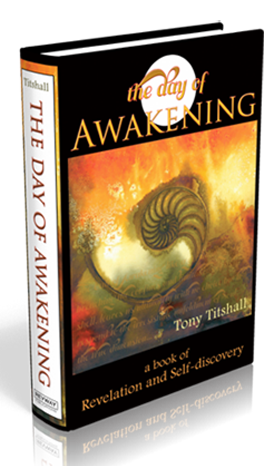 One of the first comments or questions we received about the dramatic cover design of The Day of Awakening, prompted by the immediate, literal visual impact it had on the reader, was, “Why did you use a shell on the cover?” As if inviting deeper clarification and explanation of its significance, while we cannot speak of what the artist herself saw during the process of its organic creation, we offer what can only be called our own view of its symbolism and interpretation of its imagery as follows. Needless to say, once the book was written and its message more than clear, Miriam, the editor and designer of the book, waited within herself for inspiration on what was to be the cover design, and when she saw the framed “Nautilus Shell” painting on the wall of my office, she saw how it could perfectly illustrate the mystical message of the book and its challenging path to awakening, namely the simultaneous process of that divine fire of dissolution and revelation, the path every aspirant must walk, the path that no man cometh unto the kingdom of God but by. With its journey of transformation in awareness from sense perception to soul consciousness, burning away the dross of material or human belief in the cauldron of being, the state called “awakening” evolves throughout eternity unto itself, the end being from the beginning, as man pursues the path of his own Self-discovery. But that does not save the initiate from the demands and disciplines of practicing principles and living by the Way, a work that leads the student from demonstration to revelation via the path of dissolution, and although it is undoubtedly the case that “though you go through the fire, the flames shall not kindle upon you; and through the waters, they shall not overthrow you,” going through that process of awakening, nevertheless, is an inevitable part of the unavoidable “journey” in consciousness to be made as man emerges from the dream or tomb of sense into the freedom of Immortality, the reality and truth of himself, forever One with God. Long since signifying eternity, the spiral formation shown forth so perfectly in the nautilus shell, without subjective beginning and without objective ending, together with its mathematical formula, consistency of form, and basis of design, is manifest throughout the visible universe, representing not only the timeless element and truth of life, but symbolizing the dawning or emergence of material, visible creation out of the ocean of Consciousness, the Word of Spirit becoming the flesh of form. Coupled with the symbolism of this equation, the artistic style and technique of the cover design perfectly illustrate what can be “created” when simple elements are combined and allowed to react and respond to each other. From wet paper, touches of color, and the introduction of organic form, whether that be a shell, a stone, a feather, a leaf, or even a blade of grass etc, the diffusion, natural chemistry, and interaction of the physical elements throughout the drying process is entirely spontaneous and undetermined by the mind or hand of man. This “spontaneous” form of expression is indicative of the way in which the book itself came into being, moment by moment, day to day, without one wasted word, until finally it was done. And so, in the beginning was the Word, Consciousness, and out of the ocean of Consciousness, so perfectly illustrated by the choice of wave-like font in the hidden message of its “ancient manuscript,” emerged the kaleidoscope and dawning of material creation, the second chapter of Genesis. Through its crescendo of becoming, Life emerged from the single cell, the One Being, the One Presence, indivisible substance, undifferentiated form, divine activity, and entered into the illusion of duality, a place of division, where dust returned to dust, ashes to ashes. But throughout the process of dissolution and revelation, Man, forever One with and created in the image and likeness of God, came to know Himself, leading him inexorably ultimately from darkness unto Light, and unto the Day of Awakening.